Computers, tablets, smartphones, e-readers, video game consoles — they are all around us, and at least one of them probably makes it home in your bedroom at night. But the blue light from its screen can disturb your sleep. Here's how blue screen light affects your body and how you can minimize exposure and get a good night's rest. 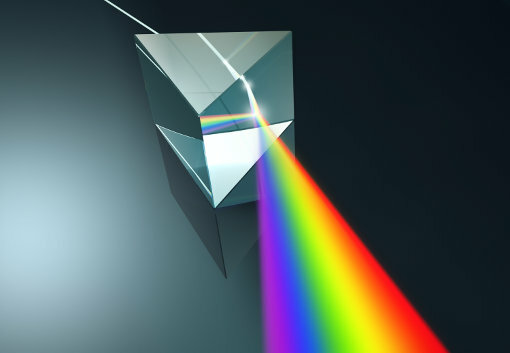 If you remember your prism experiment from grade-school science, light is made up of several visible colors. One of these colors is blue light. It has the shortest wavelength and produces the highest amount of energy among the colors in the visible spectrum. That’s why blue light is often called High Energy Visible (HEV) blue light. The sun emits blue light naturally. It’s this blue component of sunlight that gives the sky its blue color. Artificial sources of blue light include digital screens such as those on smartphones, tablets, TVs, computers and laptops. Fluorescent bulbs and LED light fixtures also emit blue light. The human body uses blue light to regulate its circadian rhythm, the internal “body clock” that affects your sleeping and waking time. Your circadian rhythm also influences your alertness, mood and general feeling of well-being during the day. This explains why you’re often active on clear, sunny days but somewhat gloomy and slow on cloudy or rainy days. Exposure to light at night generally lessens your body's production of melatonin, the hormone that does all the chemistry work of controlling the rhythm of sleeping and waking. A high level of melatonin makes you feel sleepy, and a low level makes it harder to doze off. Low melatonin levels could lead to insomnia, leaving you restless and irritable from lack of sleep. Exposure to blue light suppresses melatonin production, according to studies conducted by researchers from Harvard and the University of Toronto. Researchers have also found a link between exposure to light at night (for people who work the night shift, for example) and cancer, diabetes, obesity and heart disease. 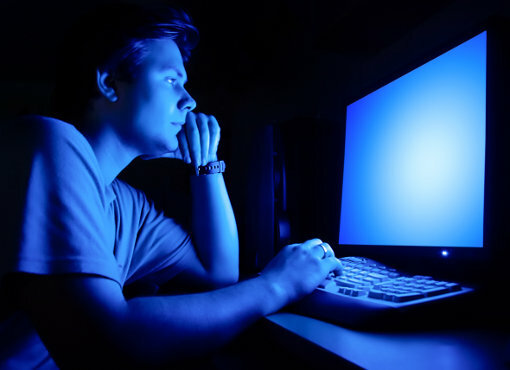 Prolonged exposure to blue light has also been found to affect sight. Since blue light has the shortest and highest energy wavelength, it creates more glare and flicker than the weaker wavelengths in the visible color spectrum. Long exposure to glare and flicker can cause eye strain, headaches and digital eyestrain or computer vision syndrome. Over the long haul, persistent overexposure to blue light can damage your retinas and speed up macular degradation that could eventually result in blindness. Who is at the greatest risk? 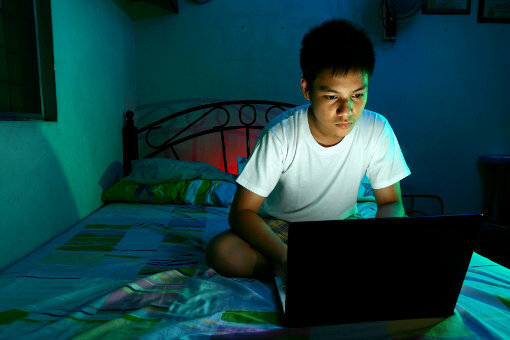 Everyone is vulnerable to the harmful effects of blue light overexposure, but people who constantly expose themselves to blue light via electronic devices such as computers, tablets, smartphones, e-readers and video game consoles are more susceptible to its dangers. Children and teenagers from age 8 to 18 are particularly susceptible because many of them use their mobile devices for more than 7 hours daily (according to a study by the Kaiser Family Foundation). The eyes of children under age 10 are still developing, and overexposing them to blue light could gravely affect their eyesight development. Blue light itself is not the danger. Overexposure to it is. Exposure to blue light during the day actually helps you stay awake and alert, but too much of it at night can disrupt your sleep. So to be able to get a good night’s rest, avoid blue light at night if possible. Turn off the lights when you go to bed. If you cannot sleep in complete darkness, use a dim red light instead. Red light still suppresses melatonin production but not as strongly as blue light does. Stop using your mobile devices about two to three hours before going to bed. If you like to read in bed on an electronic device, turn down the screen brightness so that less blue light is emitted. You can also install a blue-light-blocking filter on your tablet or smartphone. 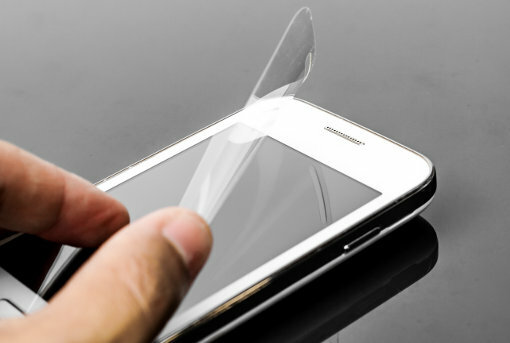 These screen protectors minimize glare and blue light at the same time. Find one that’s compatible with your device’s screen size. When browsing the Web at night on your iOS device, the Koala Web Browser can automatically adjust your screen color and brightness to help you to avoid eye strain and minimize the sleep-altering effects of blue light. If your device still runs iOS 7.1, you can ease the screen brightness with Reduce White Point. You can configure this in Settings > General > Accessibility > Increase Contrast > Reduce White Point. Several blue light filtering apps are available for Android devices. The Bluelight Filter for Eye Care app applies a yellowish tinge to the display that can be toggled via the app. Twilight automatically applies a red filter to the display when the sun begins to set. Both apps lessen the amount of blue light emitted by your Android phone or tablet. Good news for fans of e-readers: the e-ink technology in Amazon’s Kindle e-readers renders the display in a paper-like appearance that doesn’t emit blue light. Recent editions of the Amazon Fire tablet come with the Blue Shade feature for filtering blue light emissions. For non-Kindle e-readers, try switching the background to sepia, or activate night mode (which uses white text against a black background) to minimize blue light exposure. Or opt for printed books instead. Certain programs also minimize blue light emissions from your computer screen. F.lux auto-adjusts the screen brightness and color of your monitor according to the time of day, helping prevent eye strain at night and promote good sleep. If your computer runs Linux, try Redshift, which adapts the color temperature of your screen depending on your surroundings. It works like F.lux and also has a port for Windows computers. Especially if your work requires you to sit in front of a computer monitor for hours, protect your eyes with amber- or orange-tinted protective glasses. Studies show that such “blue-blocker glasses” help teenagers feel sleepier toward the evening because of higher melatonin levels. The orange tint filters blue light from your computer monitor, lessening your exposure. Brown and yellow tints also work but not as effectively as orange. Take care to impose screen time limits on young children with mobile gadgets. Don't allow them to play with their smartphones or tablets before bedtime, and restrict their gadget use time. The harmful effects of blue light overexposure are worrisome but entirely preventable. With discipline, protective gear and good safety habits, you can avoid blue-light-induced issues such as sleep deprivation and eye damage. Let your gadgets and lights rest at night, too. Your body will surely benefit it. Want to know more about how smartphones and tablets can affect your health? Read our article about how your smartphone could be harming your health. This was very fascinating to me. so i decided to put it to the test: for the first 4 days i played video games, watched TV, and had blue light in my room at night. I used a REM-Fit pillow to track. each morning i checked and i got about 50% deep sleep. the next 4 days i did the opposite i removed all blue light from my room and used my pillow again to test. and i was shocked to see that i was getting 80% deep rem sleep. mind blown. changes are being made at my house for sure. thanks for the post. Thank you for running experiment I’m hoping the science will finally convince by family. Techlicious: important info especially for children growing up with tech everywhere. Thanks for research and article. Elmer - you’re dead on. My husband and I used to play games at night up until we went to bed and always complained about how poorly we slept the night before. Once we started taking a break before bed, read a little, did some mindful meditation, the difference was HUGE. He’s also a huge fan of blue light filters (good start here - http://www.sleepxp.com/best-blue-light-filter/) and I would definitely recommend them for people of all ages. Cheers!